A beautiful day for a bike ride, leaving early before the heat of the day makes me doubt if this is a wise thing to do. I tucked some cash into my back pack just in case I might hit a good yard sale or need to make a phone call. Four or five miles into my ride as I approached an area near the Windsor Yacht Club I was surprised when the chain fell off my relatively new bike. My first thought was a lazy one – to give up and call Joyce & Len (sister and brother-in-law) to come and get me. Second thought was to walk the bike back to Lauzon Road, a distance of about a mile, where there is a bicycle shop. Nice summer day. Warm. Who wants to wear socks and running shoes? Not me. Flip flop sandals are much more easy breezy, cool. Unless you have to walk a good distance in them. Notice I said “have to”as opposed to “want to”. On this lovely first day of August day, I had no choice. I observed as the bike man quickly put the chain back on track. Your fee? “Nothing”. He accepted my $5.00 handoff and gratitude. I had a fleeting thought that I should drive straight home and quickly rebounded to my original plan of taking a fairly good distance ride to visit my friend Gail in Tecumseh. Never give up. As I recounted my tale to Gail she offered a pair of latex gloves to protect my hands from grease, just in case it happened again. And almost like the glove theory was being tested, on my way home I lost it again – the grip of the chain on the sprocket that is. I propped up the bike stand and went to work. I was tentative, not confident that I could pull this off, but gratefully it went on with relative ease. As I knelt at the bike under a shady tree along busy Lauzon Parkway I noticed a vehicle pass me, pull over to the curb lane and pause. As the repair had been completed, I slowly approached the vehicle to give my thanks and received some advice. Next time use a stick to put the chain back on so I don’t get my hands dirty – and have someone adjust the wheel to a more efficient position. My adventure today taught me two things – how to fix a slipped chain on a bike, and when cycling always wear sensible shoes… just in case. Some of the blessings of my day were the almost free bike repair guy, a considerate driver who stopped to help me, the gift of some latex gloves from a friend, and a Granny Smith apple in the middle of the road around the corner from Gail’s house, just when I needed a bit of shoring up. All it needed was a bit of shining up on the pantleg of my new Bermuda shorts. I am posting a photo with this post – no comments please about headgear and bare feet. 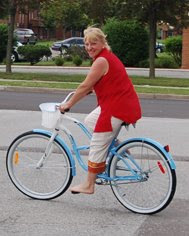 This was taken 5 minutes after I received the bike as a gift, touring around my driveway/parking lot.